Writers get into trouble when they try to understand what their story means while they are creating it. There exists an event horizon between the one telling a story and the one receiving it. What looks right from one side will look completely different from the other. Understanding Author’s Intent would be impossible if it weren’t for tiny pinholes piercing that veil. You can’t have them both—not at the same time from the same perspective. Authors predict. Audiences appreciate meaning. If you’re predicting you’re not appreciating meaning, and if experiencing meaning, you’re not predicting. This is the dilemma facing everyone trying to tell a story: I can predict what I want to say, but I’ll never know the true meaning of what I write. We predict in order to write and we search for meaning in order to rewrite. The cycle continues on and on until finally we can’t take it anymore. Unless there was some way to see both sides. 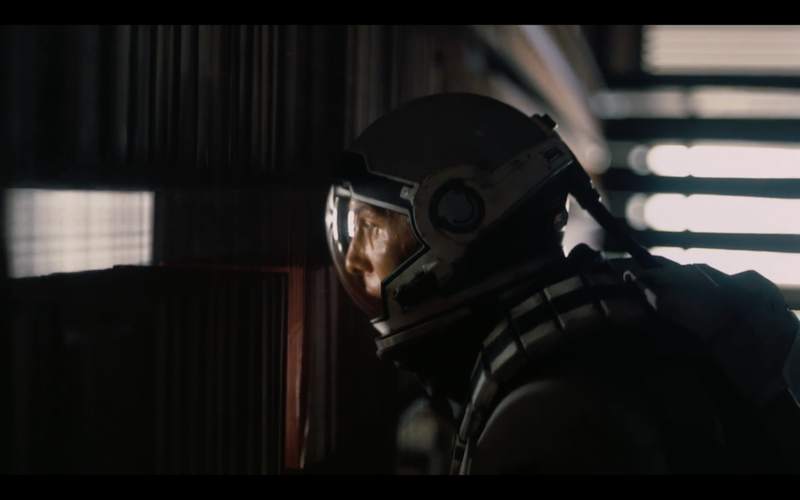 Some way to simultaneously be on both sides of that bookcase at the end of Interstellar. As Cooper (Matthew McConaughey) we could predict what is going to happen and as Murphy (Jessica Chastain) we could determine the meaning of what we saw. Possible only in the context of a tesseract designed by a future civilization? I have a prediction, what does it mean? This is the single biggest problem Authors have when they write and when they are first introduced to the Dramatica theory of story. They are so accustomed to asking What does it mean? that fail to see Dramatica for what it is: a tool for prediction. If you’re going to predict, you have to establish the meaning up front. Meaning is the baseline for prediction. I know what this means so therefore I can predict it. By definition then, you can’t do both prediction and meaning at the same time. You can’t ask what does a prediction mean? Meaning is what you stand on and use at context for prediction: I think X and Y is good, therefore I can predict what is going to happen. Prediction is what you stand on and use for context in order to appreciate meaning: I predict this is how things are going to turn out, now I can look around and see what it means, by how it compares to the prediction I made. The Dramatica theory of story can help with the second approach. With Dramatica, you have a storyform. The storyform is a collection of seventy-five story points that work together holistically to form the message behind the narrative. No one point takes precedence over the other, no one point is essential. Yet, enough points are needed to effectively communicate the Author’s Intent. A storyform is a method of predicting story points. With storyform in hand, an Author can then look back and establish the meaning of that storyform by evaluating it in terms of how it is received. But they can never try to ascertain the meaning of said story points. To do so would be an effort to distort definitions chosen and established by the creators of the theory as a means of predicting story points needed to tell a complete story. The Dramatica theory of story specifically identifies key story points and relationships between story points so that Authors can begin to confidently predict elements of their story. For instance, in a world where the Main Character is going to be a Do-er or Be-er and the Influence Character is going to be the Dynamic Opposite—which is a given in the current model of Dramatica—then if one picks what the Main Character Approach is, one will automatically know what the Influence Character Approach is going to be. One can make that prediction because Dramatica has already predefined those meanings. I have a prediction, what does it mean? You can’t do both in the same context. Stop trying to find meaning in Dramatica’s story points and you’ll start to understand why you have been struggling for so long. You have to pick one place, pick what you’re going to do, then see if you’re interested in predicting or meaning. This is one of the reasons why—when you are storyforming—it is so hard to understand what it means. It is hard to understand what the audience is going to experience simply by looking at a storyform. And that is because storyforming is predicting. An Author selects Success for the Story Outcome and Good for the Story Judgment. She wants it to end in a Triumph. That is prediction. Meaning is experience. The story points found in the storyform are those rare focal points seen by both Author and Audience. Within that veil that exists between the two, there are these very specific holes in very specific places that have very specific meanings. Those are the story points. If you look from the Author’s side and you look from the Audience’s side you are pretty much seeing the same thing. These story points allow you to predict how the Audience should interpret your story. Not how they will, but how they should. Likewise from the Audience’s side of things, they can see or sense a little hole there and think Oh, I think this is the meaning behind what this Author is trying to say with this story. I think this is what the Author wanted me to find out. And it was…because it was baked into the whole thing. From the Audience’s viewpoint, experiencing a story is like experiencing a great meal. They think to themselves Well in this recipe I know they used olive oil, not peanut oil. Because I can tell from this flavor right here. I can’t see olive oil, so I’m not sure what kind. But I know it has a kind of olive oil taste to it. That is how the story points in a storyform function. They are those strange interference patterns between predictions and meaning where you can stand at two different place and see the same thing. When Author and Audience stand in the same place, they see two different things. The Author sees prediction. The Audience sees meaning. With a competent storyform in place they can stand at two different places and see the same thing. That is the basis for effective communication. That is the basis for a great story. Both Author and Audience can now look at the same place in a story from two different points-of-view. The Author looks and says This is how it there and here is where it is going. The Audience looks at the same and says This is where it all seems the meaning is and what it looks like it might ultimately mean…but I don’t know yet. I haven’t experienced it all yet. It can all of a sudden turn on a dime for the Audience because of new information. They can’t predict, they can only ascertain meaning. Writers predict. Audiences establish meaning. A functioning storyform pierces the veil between both perspectives and offers a funnel for connecting the mind of the artist to the mind of the receiver.